We moved into our new cabin today – now with significantly less skunk. The rooms in the main lodge are fine, but the cabins are a little bigger. We did notice though that at the humidity in the cabins seem to be quite high – all our clothes feel like they’re a little bit damp. No matter, the great outdoors beckons, along with fresh air and vigorous exercise. Meal options in the Valley are kind of limited. We did breakfast and dinner several times each in the main dining room of the lodge, primarily because it didn’t require driving anywhere. The main dining room is quite magnificent in a baronial hall kind of way, and as we come to expect from National Park eateries, the food is fair to middling, with one or two standout items. Perhaps we’re just food snobs, though I prefer the term, epicures. 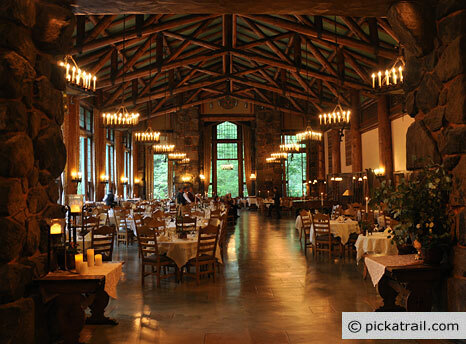 I think in the case of places like Anwahnee Lodge, and the El Tovar in the Grand Canyon, the high prices are only justifiable due to the location and historical ambiance. We did mix things up and ate once at Yosemite Lodge, which wasn’t nearly as impressive a lodge, nor a dining room, for that matter, and the food was around the same quality, though a bit cheaper. There is a fairly comprehensive grocery store in the valley, so it is pretty easy to put together a picnic lunch, as we did, to take with you and consume while you admire the scenery. So, partaking in a fair amount of gorgeous yet non-risky hiking – check. Sleeping at the Anwahnee Lodge – check. Eating at the Anwanhee lodge dining room – check. Three days spent in quiet contemplation of nature after consumption of a pretty decent stack of blueberry pancakes – check. Another famous National Park on our bucket list – delisted! Even if you have only a day to enter the park and check it out – do it. It really is up there with the best of the scenic wonders of these United States, like the Grand Canyon, Glacier Bay, Mount Rushmore, and Donald Trump’s comb-over.